Chemically-bonded nonwovens, thermally-bonded nonwovens, fibre-bonded nonwovens, wetlaid nonwovens, water jet nonwovens, spunbond nonwovens …. These above named manufacturing processes are well-known and extensively-used technologies used in the manufacture of nonwovens. In general two technologies are important in the manufacturing process. – one is the web forming process, the other the bonding process. In the group wetlaid and spunbond, the web forming and bonding processes are carried out in a single process. Even spunbond nonwovens can be further processed with water jets to achieve special properties. 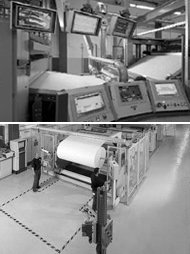 In practice nonwovens are often described by special terminology in which web forming and bonding technologies describe a certain type of nonwoven. A list of the most important nonwovens can be found using the navigation keys.